For this bento, I decided to use the mock shrimp I bought in a little different way. I cut up some cabbage, onion, garlic, green onion, and mushrooms and stir fried it with the shrimp. I also added a little kimchi for extra flavor and spiciness. For the sauce I used a sweet asian sauce that I made to accompany some summer rolls I made for dinner. I also sliced up some cucumber from my Mom’s garden and made an asian cucumber salad with that. 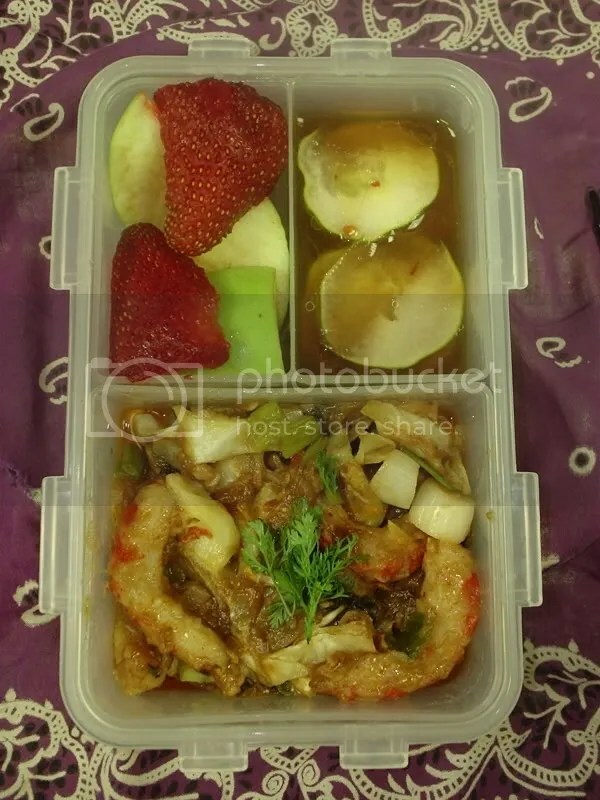 Then all I had to do was slice up some strawberry and apple and this bento was ready. Since I’ve been kind of lazy lately when it comes to making my bentos, I decided to make some onigiri for lunch today and freeze the extra for future bento lunches. First here’s the onigiri that I made. 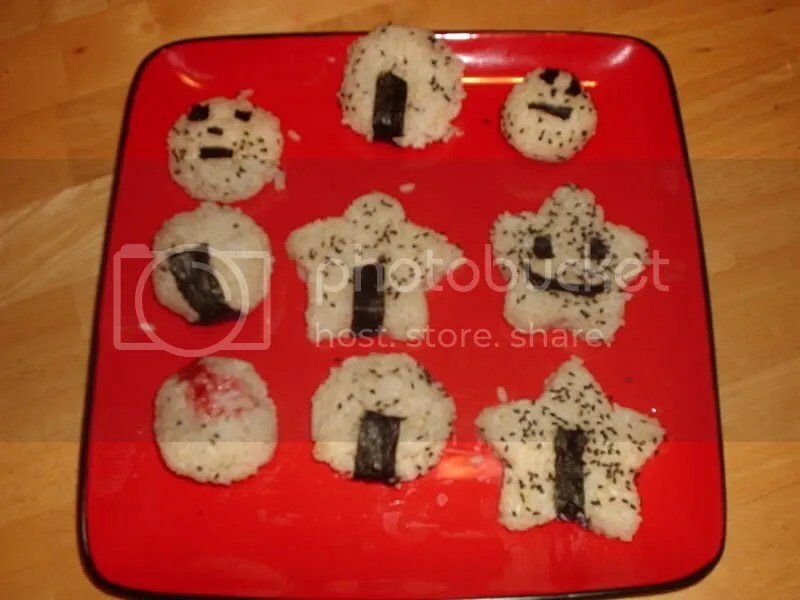 I made all the rice balls by hand except the cone, star and heart shaped ones. I used a plastic bag, cookie cutter, and cupcake baking cup respectively. Here’s the bento I made for lunch today. 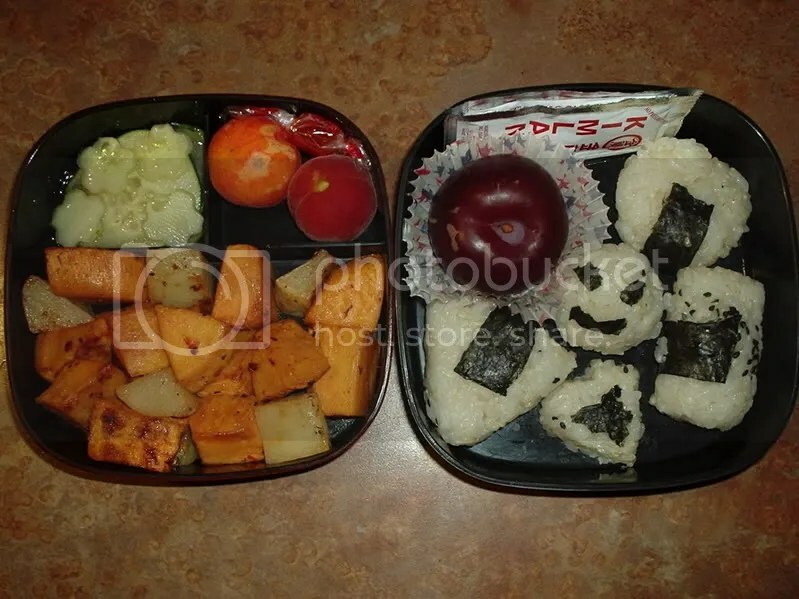 There’s leftover roasted sweet potato, a couple small peaches, rice candy, and asian cucumber salad, onigiri a plum and soy sauce packets. I just had it all and it was very yummy!